In 1999 we bought the domain name www.poissonrouge.com. We wanted www.fishcake.com (we even had a logo ), but it was taken. We were listening to , a musical tale for children by Philippe Chatel. At the beginning, the narrator starts telling the story of the “very red fish who is bored in its very big aquarium”, but Emilie, the star of the tale reminds him that it’s her story that he is supposed to tell…, the name was available, so we decided to tell the story of the red fish . Later we bought www.redfishsoup.com to help non-French speakers find the site. Following the advice of Tudor Watson at www.tangentweb.com, Patric decided to teach himself Flash. Internet was mostly an ugly place at the time, too textual, following print conventions too closely. We wanted to change that, make the Internet a better place (then the World). 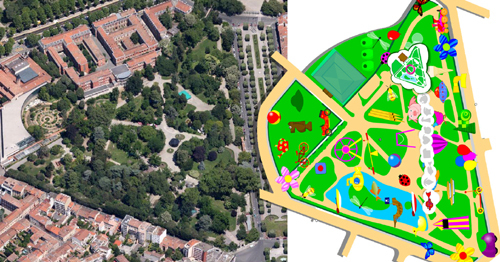 The team moved to Toulouse, just long enough to imagine the Rycroft Park (named after a very good friend of ours), copied from the map of the very inspiring Toulouse botanical gardens. Nick Kirkpatrick at Ragdoll (of Teletubbies fame) put a child in front of the site and realised that we were onto something. He invited us to come and meet him at MIP TV in Cannes. We blagged a couple of tickets and went for our first meeting with Ragdoll. We also had a child (called Amos) that year. 2002 – We got married (to each other). Once that was out of the way, we could get on with some serious stuff. During that period, we had a meeting with the BBC website producer, announced we wanted to do a website for Teletubbies. She laughed at us. In September 2003, Ragdoll called us back to the UK to work on Boohbah and Teletubbies websites for (both these websites have been taken down, but can be found on the “Wayback Machine” : PBS Teletubbies and PBS Boohbah, we also signed up for www.ragdoll.co.uk, for which we got a “Daily Sucker” in 2005 on www.webpagesthatsuck.com (sadly, the full review doesn’t seem to be available anymore, it’s a shame, it was highly entertaining!). PBS were working on a mini-site for the Kratt brothers’ animal life series, they called Poisson Rouge to help build it. This website is not working properly on the WayBack Machine, but a good review can be found here: PBS Kratt’s Creatures review. While we were there, the 100 year old, 20$ bill elm tree in the White House gardens got struck by lightning. Nothing to do with us. What started as a creative outlay was getting very big indeed. Traffic was starting to get out of hand and so the team concentrated more and more on the website. Apart from anything else, it was fun! Toby Skinner, at www.globaloptima.co.uk who had started working with Poisson Rouge on the other projects was on board and our fans were asking for t-shirts and other merchandising items, so a small shop was added. Some people didn’t want to buy anything, but they wanted to contribute to the site, so donations buttons were added. This kept the site going for a little while. of Communication & Media Studies of Athens University, to present our site to an audience of 250 teachers and teacher trainees as part of EPINOISI, a project on games-based learning for students with mild intellectual disability. We also had a fantastic fish meal! Here is an abstract of the presentation we gave: Athens abstract. Later on, Sotiris Kirginas helped us with the Greek Alphabet and the School of Greek as he needed them for a project. This is the paper that he wrote: EUTIC 2010. Traffic went up to nearly 100,000 visits a day in early 2010. As a joke for April the 1st, the screen went black, with a message telling the site couldn’t go on, a few seconds later some giggles were meant to be heard. Well it didn’t work, or rather it worked too well and this is what happened: Silly joke. Despite the supporting messages, after that prank and perhaps because the messages for financial support became more pressing, traffic went down to about 60,000 visits a day. 2013 – This is the end – or is it? So the website grew, so did children, but the books didn’t quite balance and after a couple of years of questioning, we had to close down the company. What was to become of the site? Demotivation was at its highest. The response from fans was overwhelming, in quantity and content. Parents and teachers alike were begging us to reconsider. So we did. At the end of 2013, we made a decision that was to change everything: we decided to continue with the site but asked everyone to participate financially. The date decided upon was February 15th. And it worked! The site could continue, being independent, without adverts and at a fair price. Now nearly 16 years on, the rest of the story is being written, with your help. Many thanks for sticking with us all these years and welcome if it is your first time. Here’s to many more years to come. Long live the fish!